It's always been beneficial to have quality landscaping around your home or business. This will keep the inside and outside views to be more pleasant and professional looking to your guests. Some natural beauty and design options for your background and landscapes are palm trees and hedges. These species of trees are great for beach lovers because they give you the ambiance of a summer vacation at the seashore wherever you might be. Because of the high demand in the market, we decided to focus our efforts and provide our customers the best quality of palm trees and hedges for sale in the state. Our company which is located in Ruskin, Florida has a reputable name for providing retailers the highest quality service and expert help for your palm trees. 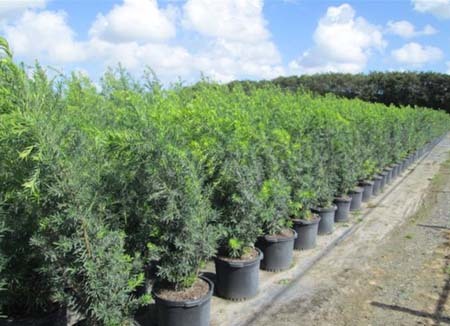 We are Florida's leading whole sell dealer of high grade palm trees, landscape plants and hedges. Buying the perfect landscape hedges for your area can be a difficult task. That's why our company provides our clients expert advice and huge selection of plants to meet your needs. We are Florida's one stop shop when it comes to all things palms and hedges and guarantee to give you the best breeds available for your landscape ideas. If you have been wondering which place is the best to buy wholesale hedges our company A Quality Plant can provide you that. Some of our selections of hedges include the Areca Palm that has a overall height of 8-10 inches with a price of $120.00, Bismark Palms which has height of 14-16 inch that is more temperamental and needs to be properly planted is priced at $550.00. We also have Canary Island Date Palm, also known as the pineapple palm which has an overall height of 2 inches inches and has a clear trunk with a price of $250.00. The Dioon Edule, Washington Palm, Silver Date palm, Medjool Palm, Sago palm and many others can be found at our website which has reasonable prices that start from $35.00 up to $3,800.00 depending on the breed. Our wholesale hedges are well managed and cared for our experts around the clock to provide the highest quality palm trees and hedges for sell. Other than selling our hedges, we also offer landscaping services. We can assure our customers to have the best services for landscaping since we have highly trained and experienced individuals to help you create the dream landscape for your property. We know how eager you are to have a beautiful landscape and that demand pushes us to give you exceptional service and products year round.